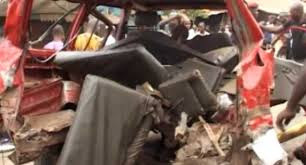 20 people reportedly lost their lives while others sustained injuries in a road accident which occurred on Epinmi-Isua Akoko Road, in the Akoko South-East Local Government Area of Ondo State on Tuesday. It was gathered that the vehicles involved had a head-on collision on the road. An eyewitness, who declined to be named, said 14-passengers Toyota bus collided with a Range Rover. It was also leant that after the collision, the two vehicles caught fire which consumed some occupants of the vehicles. He also explained that the drivers of the two vehicles survived the accident with injuries, adding that they were receiving treatment at the hospital. It was further gathered that the men of Federal Road Safety Corps in Ikare Akoko rushed to the scene of the accident and coordinate the rescue operation. They reportedly deposited the corpses of the victims at the morgue of the Ondo State Specialist Hospital in Ikare Akoko. The Public Relations Officer of the FRSC, Ondo Sector Command, Mrs Antonia Oni, said she could not confirm the accident because she was away on an official duty. But the Police Public Relations Officer of the state police command, Mr Femi Joseph, confirmed the incident, adding that the accident occurred as a result of reckless driving on the part of the drivers of the vehicles involved. He said, “It was a sad incident, 15 people initially died in the fire, they were burnt beyond recognition, while five others died on the way to a hospital.